I’ll start by saying that this past weekend was my first time EVER at Coachella. In my eyes, the Empire Polo Field has been the home of my favorite festival: STAGECOACH. I’ll admit, I was skeptical about attending Coachella; I almost felt like I was cheating on what I called the ONLY great festival in the California desert. But, I pushed my hesitations to the LEFT, as one of this year’s headliners would say, and decided I had to experience this OTHER festival for myself. As an LA native, Coachella is CONSTANTLY a topic of conversation; everyone and their mother has a story about “when they went to Coachella.” I mentally prepared myself and tried my best to erase the preconceived image of walking into a cowboy filled Indio. BOY WAS I RIGHT!! There was not a cowboy in sight. In fact, there was no conformity AT ALL! In a world where we are constantly faced with the pressures of socially construed norms and expectations, I was stunned to say the least. It seemed as if I had walked into a desert haven that was left uninfluenced. Untouched by the homogeneity that forces us into stalk images of “perfection.” It was a BEAUTIFUL sight. I went to a music festival and walked into an oasis. It was DYNAMIC. I genuinely didn’t realize until that moment, when I started on my way past the crowded campgrounds and into the security line, Coachella is much more than a music festival and fashion show: it has become a medium for self-expression. 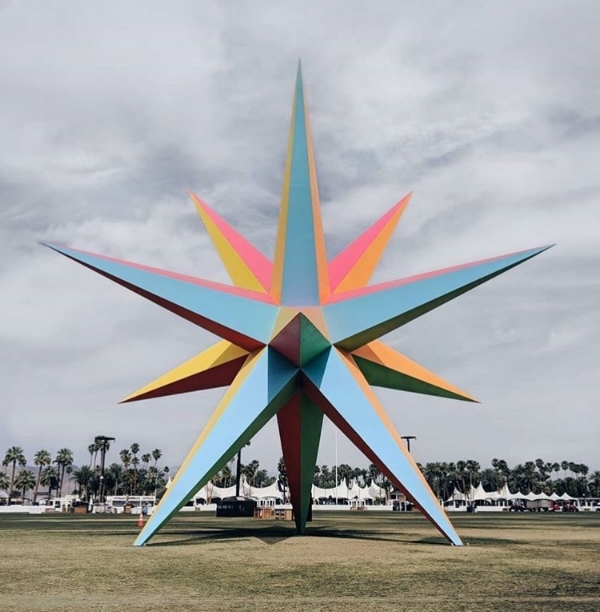 From the musical performances to the artistic installations, each and every BODY present at the festival became a witness and contributor to the vast spectrum of ingenuity prevalent at Coachella. NOTHING was off limits. In fact, it felt as if it was all welcomed, maybe even encouraged. The framework of the festival is rooted in music, one of the most demonstrative methods of emotional expression. With that in mind, it’s clear how the environment spurred/provided a platform that recognizes there is no such thing as “ONE SIZE FITS ALL,” in regard to anything/for any topic. IT CLICKED! We are all individual avenues of self-expression and we NEED to exercise that! Coachella is a place where we can do that. But we also have access to a vast number of other tools. WE just have to utilize them and be active champions of our own voices. Whether we use our skills in art, writing, fashion, leadership, and/or music etc., we need to NURTURE and EXPRESS our voices daily. I know these are small strides in the big picture of social acceptance and normality, but they ARE still strides. Recognizing and applauding singularity is the kind of RESPECT for each other that should be the norm. Working at WURRLY allows me to exercise my voice daily, not just on the application but also in the office. I don’t know about you, but I want to be able to re-live the experience I had at Coachella and let out my inner BEYONCE. I know I don’t sing like she does, but does that matter?? NOPE!! I can adjust the key and make it my own. It’s not about being the “best”, it’s about finding those opportunities that allow individuality and creative flair to shine through. So… THANKS Coachella!! For the reminder to embrace that boldness I often forget I even have. If you’re feeling inspired, like I was after singing along to some of my favorites this weekend.